We’d been looking for quite some time for just the right barstools which were both utilitarian and attractive in our beautiful beach house. We needed the right height, the right width, and well made or solid, without being too heavy to move out from the often used cabinets beneath. These met our needs perfectly and as you can see, they are very attractive and fit with our decor perfectly. They are versatile so they are likely to fit with most any decor. They were very well priced and delivered quickly. I highly recommend! 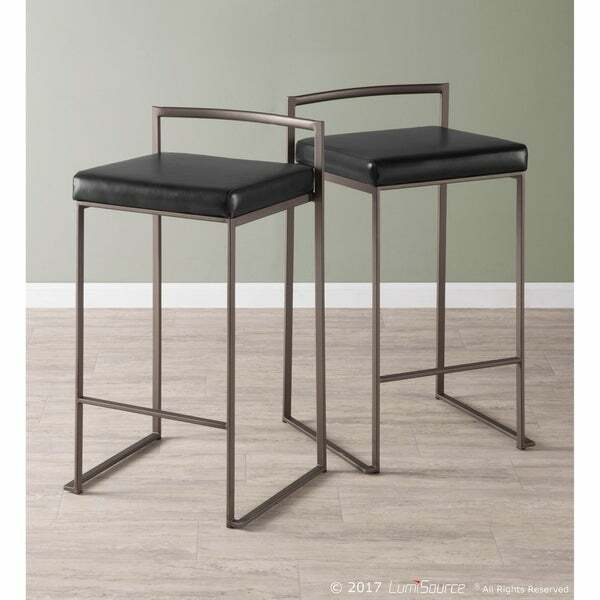 Lend understated refinement to your counter space with this set of two Fuji stools. Stackable for easy storage, these modern stools are available in an array of color combinations to complement practically any contemporary home. The thick padded seat is soft and comfortable, and a dark antique finish completes the industrial design. Dimensions 16.0 In. X 17.5 In. X 31.0 In. Easy to put together, arrived quickly. 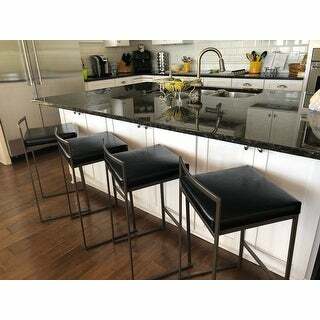 I bought 4 of gray seat stools and pleased with the stability and modern look of them. My Fiance is 220 lbs and still feels secure sitting on these! The only assembly required was attaching the seat to the base with three screws. I love how these chairs can stack but are also very sturdy. The PUC seat feels like real leather in thickness and in texture. I absolutely love these stools. I was looking for something that was subtle yet modern and that’s exactly what I got. In addition, the customer service is top notch. I had an issue with one of the cushions and they were able to replace without any hassle. Love these chairs. They are very sturdy. They look expensive and are well made. They are super comfortable to sit on. Very easy to put together. Perfect color and size for my kitchen. Very sturdy and well made. "What color are the legs." The base color is an antique (dark bronze-ish) color.